What can brain research offer people who stutter? Brain provides researchers and clinicians with the finest original contributions in neurology. Leading studies in neurological science are balanced with practical clinical articles. Its citation rating is one of the highest for neurology journals, and it consistently publishes papers that become classics in the field. There’s something compelling about watching a person who stutters find a way to experience fluent speech. British TV viewers witnessed such a moment on Educating Yorkshire, back in 2013. When teenager Musharaf Asghar listened to music through headphones during preparations for a speaking exam, he found that his words began to flow. Singers, like Mark Asari who is currently competing on The Voice UK, also demonstrate how using the voice in song, rather than speech, can result in striking fluency. In fact, a range of techniques can temporarily enhance how fluently a person who stutters can speak. 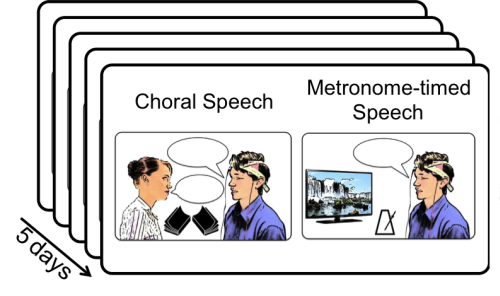 Changing auditory feedback by delaying it, or “drowning” it out with music, or altering habitual speaking patterns by singing, or speaking in time with a metronome, often results in an immediate increase in fluency. However, the effect disappears as soon these alterations are removed. Although the underlying mechanism isn’t completely understood, these effects indicate that people who stutter may show brain differences in how the signals guiding speech movements are integrated with feedback on the sound and feel of speech. Brain imaging studies of adults who stutter do reveal differences in both the structure and the function of the circuits involved in speech production. For example, a number of studies show that the bundle of nerve fibers connecting the sensory and motor brain areas involved in speech production is less organized in people who stutter. This could affect communication between these brain areas, causing speech disfluency. There are also differences in the patterns of brain activity we see when people who stutter speak in the MRI scanner. An area in the left frontal part of the brain – an important hub in the circuit that plans and executes speech – is less active in people who stutter than in people who don’t. The equivalent area on the right side is often more active in people who stutter. We think this pattern of increased activity on the right could make up for the lack of activity on the left, but it might also reflect the stuttering process itself. So, how can information about the brain differences in people who stutter be used? When discussing our research with people who stutter, and others with an interest in this area, it’s become clear that just knowing about these findings can help. The cause of stuttering has been debated for many years, and a “nervous personality” has erroneously been offered as a likely explanation. Another unhelpful belief is that it’s possible to “grow” or “snap” out of this way of speaking. So, being able to point to a neurological difference located in brain regions controlling speech, can be a welcome reassurance that such myths have no basis. Image credit: An intervention session of the tDCS randomized controlled trial. Used with permission. Advances in neuroscience mean that brain imaging findings can now inform non-invasive brain stimulation studies aimed at increasing speech fluency. As speech therapy outcomes for adults who stutter can be limited, our team recently completed the first randomized controlled trial investigating whether transcranial direct current stimulation (tDCS) could be usefully applied in therapy. TDCS involves passing a very weak electrical current across two surface electrodes placed on the scalp, and through the underlying brain tissue. This changes the excitability of the targeted brain area. When it’s paired with a task, the change in brain excitability from the tDCS can interact with task-related brain activity, resulting in improved performance and learning. The parameters for safe, painless application of tDCS have been established from large body of research studies, and the equipment is portable, and relatively affordable. For these reasons tDCS has attracted interest as a therapeutic tool for conditions that affect how the brain functions. We used two temporary fluency-enhancing techniques: reading along with another person, and speaking in time with a metronome. In combination with this, we applied tDCS over the left inferior frontal cortex – the key area for planning and executing speech movements which is relatively less active in people who stutter. We were interested in whether pairing tDCS with the tasks, practiced in 5 daily sessions, would increase speech fluency after the intervention was completed. Thirty adult men who stutter were randomly assigned to real tDCS or an indistinguishable “sham,” or placebo, tDCS. The group receiving real tDCS showed persistent improvement in their speech fluency six weeks following the intervention, compared to the group receiving sham. TDCS reduced stuttering symptoms by around 25%. Our results show that tDCS is certainly a promising approach for fluency intervention, and we are continuing to study it’s use. However, the relationship between the fluency of our speech and our perception of ourselves as speakers is far from straight-forward. For this reason, increasing speech fluency may not necessarily give a person who stutters a useful therapy outcome. In fact sometimes feeling you are “chasing fluency” can be a particularly negative experience. For example, living with a covert stutter involves avoiding any possibility of stuttering, with the constant fear that a moment of disfluency might slip through. Overtly, speech appears completely fluent, but the burden to the person who stutters to maintain this illusion is huge. Speech and Language Therapy in the United Kingdom for adults who stutter is varied so that all experiences of stuttering can be addressed. Therapy may include approaches to increase fluency, to stutter with less struggle, or to build more positive thoughts and beliefs about living with a stutter. Some combination of these approaches often yields the best outcome for any one person. Image credit: Design of the tDCS randomized controlled trial intervention. Used with permission. Of course, some people who stutter choose no therapy at all. An approach that is universally beneficial for educating us all about stuttering, and supporting those of us who have this condition, is to acknowledge the strength, resilience, and considerable talents of people who stutter. Five years on from the first airing of Educating Yorkshire, Musharaf Asghar is now a motivational speaker. He is an inspiration, not because his stutter has disappeared from his speech (it hasn’t), but because he speaks with confidence about his experiences of living with a stutter, as one facet of who he is. Understanding the brain differences that are associated with stuttering, and using this knowledge to shape and improve interventions, is one of the many ways that we can support people who stutter to live the life they choose. If a person who stutters chooses to work on their speech fluency, non-invasive brain stimulation could allow us to give them the best possible outcomes. Featured image credit: Brain by GR_Image. CC0 via Pixabay. 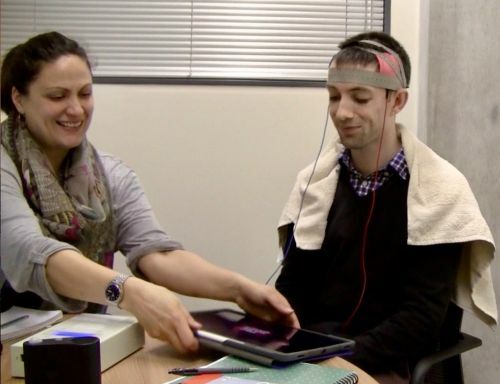 Jen Chesters, DPhil, is a post-doctoral researcher and speech and language therapist in the Speech and Brain Research Group at University of Oxford, UK. 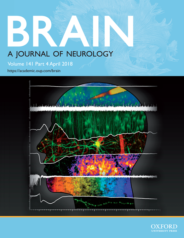 She is first author of “Transcranial direct current stimulation over left inferior frontal cortex improves speech fluency in adults who stutter” recently published in Brain: A Journal of Neurology. She is now working as part of the INSTEP trial team, investigating the use of tDCS with adults who stutter. You can follow her on twitter at @jen_chesters. Interesting read. As a male with an occasional stutter I wonder if you have considered the lower left half activity / higher right half activity could be due to the persons interrupted speech and his simultaneous search for a word he won’t get stuck on? This represents a strategy that I use. Somehow I can tell when I will get stuck and search for a synonym that I would be fluent with. I know someone who reads flawlessly in church but cannot speak to others without stuttering nearly every sentence. I have encouraged her to read out loud in church, and she is building in confidence and also is a big help to me as a pastor.